I ask that question as my clothes get drenched in smoke from my third barbeque of the week; watching local politicians converse in front of Market Square, as I serve them burgers. I ask that question as I take pictures of tournament participants while riding around in a golf cart, hanging out with ex-street youth, super rich people, and middle class folks. I ask that question as I stand waving my arms, decked out in white linen and tassels, my face plastered with dark bronzer, as I stand on a scissor lift in the snow, dancing to Bony M’s “Mary’s Boy Child” while pretending to be an angel. I ask that question as I sit, wedged between my translator friend and a man trying to sell his chicken in the back of a matatu bus in rural Kenya. I ask that question as I join George Stromboulopolous’s studio audience, meet the Mayor, cry over a mentee’s suicide, interview campus deans, go bowling with homeless men, learn the basics of teen drug culture, attend meetings as the youngest participant by twenty years, lead canoe trips through Algonquin Park, write about my heart’s concerns, and become immersed in aspects of the community I never knew existed. University was an incredible time of my life, full of delightfully random adventures and experiences. 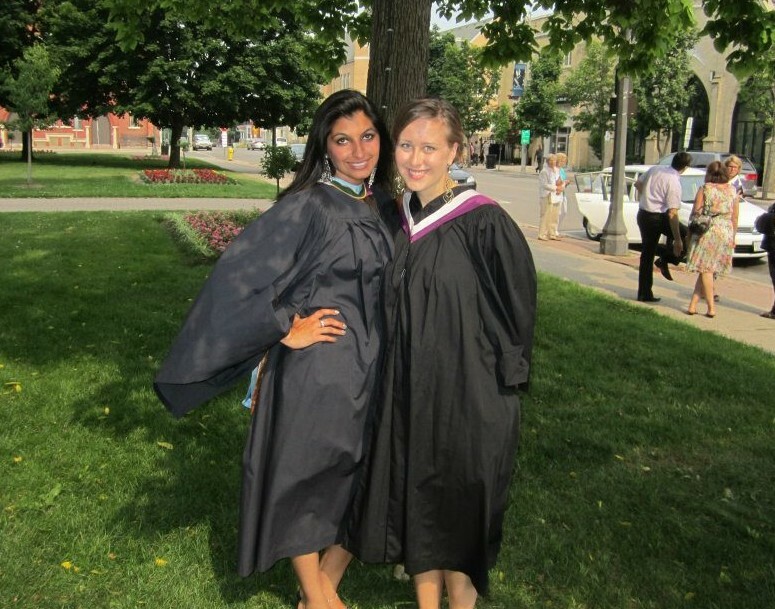 The five years I spent as a Laurier-Nipissing Brantford student are absolutely precious to me. Opportunities related to my education in Brantford led me to act in Christmas plays, to get involved behind the scenes in dozens of community events and fundraisers, and even to volunteer and do research on the far side of Africa. The anecdotes of my university life are the sources of laugh lines that have appeared prematurely on my face. My stories aren’t really about classes, or friends, or residence, or sports teams, or the student’s union, even though all of those things play a role in my university journey. My stories are about how opening myself up to greater understanding and opportunity changed my life and enriched me in powerful ways. There is no way to sufficiently emphasize how getting outside of the classroom and even off campus will broaden your understanding of life and participation as a whole. Even years into university, I struggled when I saw things that weren’t good enough. People’s needs weren’t being met; issues weren’t being addressed. Sometimes, there was simply nobody stepping up to fix the countless problems evident everywhere I looked. It took immersion in community culture to realize that perhaps I could be someone who stepped up and did something about the problems. The completely overused, completely cliché Ghandi quote, “Be the change you wish to see in the world,” is completely right. Smart guy. It was halfway through my second year that my vision widened and I saw people whose eyes were open to needs. Motivated individuals abandoned indifference and complacency to embrace the somewhat lonely road of doing, knowing they most likely would not be paid, recognized, or appreciated as much as they would be elsewhere. They are utterly inspiring. We’re all wired differently. Sometimes I’m surprised and confused at the kinds of things I am passionate about, compared to the things that don’t spark my interest. I could talk about community development all day, but don’t even try to ask me about my favourite band because pop culture has never even slightly amused me. In this community, there are people who are passionate about the arts, homelessness, politics, animals, classrooms, architecture, journalism, sports, religion, international aid, marketing and more. I could never do everything, and I’m not built to try either, but when it comes to the things I am passionate about, I have learned to DO. University for me was a platform for the expansion of everything that I am. Not only did I learn how to see, understand, and participate, I learned how to do by taking hold of the opportunities around me. How did I get into all of those situations? By saying yes, by choosing to do. In these five years, I may have earned a Bachelor’s degree, but I will further my education in doing for the rest of my life.